We tested out the How Wheels Wall Tracks with one of our favorite 5 year old boys. 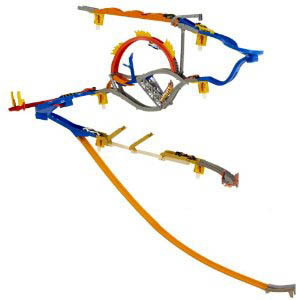 We used the “Starter Set”, but there are other sets too which can be combined together to create an even longer race track. Setup and installing the track to the wall was easy and “parent friendly”. The track comes with 3M Command stickers that are used to tape the track to the wall. That means no holes or drilling and it will be easy to take the track down later. The track has brackets that get stuck to the wall and then the track pieces stick into the brackets. This means that even if kids play rough with the track, the track just pops out from the bracket (no wall damage and easy to just pop the track back into the bracket which is still secure on the wall). This track has a high fun factor. There are multiple diverters that can be adjusted to make the race car take a different path. Here’s a video of our 5 year old playing with this track. Overall this is a great toy and fun race track.